Say you're a high-profile media company and you've got a hit show on your hands that delves into the shadowy world of horse racing. You know what might be in your best interest? Keeping the horses alive. First off, because they're the stars of your show. (What, you were going to say Nick Nolte?) But most importantly, it's because people get really pissed off when you let animals die for no discernible reason. And yet, a third horse has now died during production of HBO's meh-rated show Luck, which is winding down its first season. (It's already been renewed for a second.) 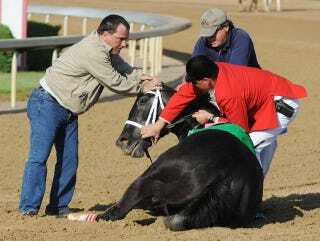 The first two horses died during racing scenes, but this latest fatality sounds like the result of a freak occurrence. "The horse was on her way back to the stall when she reared, flipped over backwards, and struck her head on the ground," [California Horse Racing Board veterinarian Gary] Beck said in a statement. An attending veterinarian determined that euthanasia was appropriate, he said. PETA, as you might suspect, is none too pleased with this recent development. But don't expect HBO or executive producers David Milch and Michael Mann to come clean about who the horse was and what condition he was in. They refused to tell us anything about the first two horses, so with the help of caring whistleblowers, we unearthed the disturbing evidence ourselves: One horse was drugged, and the other was arthritic and hadn't raced in years. Neither one should have been anywhere near a racetrack.